How did white bread, once an icon of American progress, become “white trash“? 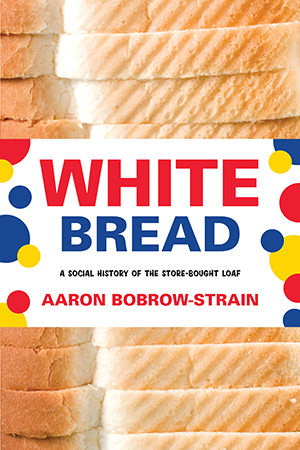 In this lively history of bakers, dietary crusaders, and social reformers, Aaron Bobrow-Strain shows us that what we think about the humble, puffy loaf says a lot about who we are and what we want our society to look like. White Bread teaches us that when Americans debate what one should eat, they are also wrestling with larger questions of race, class, immigration, and gender. As Bobrow-Strain traces the story of bread, from the first factory loaf to the latest gourmet pain au levain, he shows how efforts to champion “good food” reflect dreams of a better society-even as they reinforce stark social hierarchies. In the early twentieth century, the factory-baked loaf heralded a bright new future, a world away from the hot, dusty, “dirty” bakeries run by immigrants. Fortified with vitamins, this bread was considered the original “superfood” and even marketed as patriotic-while food reformers painted white bread as a symbol of all that was wrong with America. "Whatever you think of white bread, its history is full of surprises. And Bobrow-Strain shares this history with wit, style, and imagination. This is a richly researched and cleverly told story." "This book provides an enlightening take on bread's social and cultural value. Bobrow-Strain blends academic rigor with a friendly, insightful tone, making White Bread the best thing since...well, never mind." There are people who believe that drinking raw milk can cure illness and restore the body to natural harmony. There are people who think that drinking raw milk is like playing Russian roulette with microbes. There are a few farm families that drink raw milk just because it’s what they have around, and a lot more folks who have never given raw milk a single thought because it’s so unusual. Then there are those for whom raw milk is both scary and seductive, wholesome yet menacing. That’s me. A city kid, I grew up playing in vacant lots, not the back pasture. My idea of nature always involved a campground--I had no experience with the working nature of food production until I was in my twenties. The first time I saw milk come out of an actual cow, I was twenty-five and learning to do the milking myself while interning on a ranch in Arizona. “Red” was her name--the cow, that is. Red is not a particularly creative name for a cow, but my wife, Kate, and I came up with a lot more colorful monikers: the kind of names a cow gets called when it kicks over the milk pail, when it kicks over the feed pail, when it intentionally stomps your foot or butts your shoulder with its ornery old lady horns. Red’s was the first clump of hair I ever saw floating in my milk. Before Red, I had never drunk milk with the scent of cow still lingering in it or wondered how much barnyard dust in the milk constituted “too much.” I thought Listeria was something you used mouthwash to get rid of, not the bacteria responsible for a deadly milk-borne sickness. Since then I have drunk a lot of raw milk, most of it illegal, thanks to strict government regulations slanted toward large high-tech dairies. I don’t ascribe any particular natural virtue to milk’s unpasteurized state, but I’ve come to like the grassy taste and the sense that I’m getting my milk direct from a local farmer. Despite all that, though, I have never gotten over the slight flutter of unease I first felt drinking raw milk--the modern intuition that maybe there was something dangerous about getting milk from a cow instead of a factory. This unease has haunted Americans since they first began to grasp the existence of an invisible world of small, possibly threatening organisms. Not without cause. In the late nineteenth and early twentieth centuries, city residents got their milk from fetid, overcrowded “swill dairies” or off unrefrigerated train cars traveling overnight from the surrounding countryside. Until mandated pasteurization, milk was a key vector for typhoid and other serious diseases. Throughout U.S. history, anxieties about tainted milk have been matched only by concerns about meat. Most notably, The Jungle, Upton Sinclair’s 1906 book about unsanitary conditions in Chicago’s stockyards, galvanized a nascent consumer protection movement. Muckraking journalists, campaigning scientists, and an army of civically engaged middle- and upper-class women horrified by unsafe food took to the streets, courts, and legislatures, demanding change. Sinclair had hoped to spark outrage over the inhuman conditions experienced by immigrant meatpackers. Instead, the country fixated on germs and the frightening immigrants who appeared to spread them into the nation’s food. “I aimed for the people’s heart,” Sinclair is said to have reflected, “and by accident, I hit them in the stomach.” Still, when it came to protecting stomachs, the Pure Foods Move ment, as it came to be called, achieved substantial reforms. Pure Foods activists forced manufacturers to change the way they handled and distributed food, boycotted unsanitary establishments out of business, forced state and local officials to take food safety more seri- ously, and passed what still serves as a the bedrock of all federal food safety regulation, the 1906 Pure Food and Drug Act. Unfortunately, their efforts were far from perfect and were steadily watered down over the next century. At the start of the new millennium, Pure Foods crusaders’ concerns still seem shockingly contemporary. Serious food-borne illnesses affected millions and sent hundreds of thousands to hospitals during the 1990s and early 2000s. E. coli in beef emerged as an almost ordinary source of tragedy, while sensational outbreaks of food-borne illness in bean sprouts, strawberries, cilantro, eggs, peanut butter, and spinach gripped the media. Food safety regulations, some with roots in 1906, appeared impotent in the face of a far-flung global food sys- tem dominated by powerful corporations. In many cases, regulators themselves seemed to have been “captured” by the very companies they supposedly oversaw. It felt like the 1900s all over again. On the other hand, few Americans alive today can imagine a time when the specter of unclean bread was as scary as germ-clotted milk or tainted beef. And yet, during the late nineteenth and early twentieth centuries, the menace of contaminated bread was no less a topic of public outcry than dirty meat or milk. Pure Foods crusaders targeted the nation’s bakeries, government hearings convened around bread contamination, and Harvey W. Wiley, the country’s most prominent Pure Foods advocate, warned consumers of serious threats to America’s staple food. Accurately or not, a simple loaf of bread from a small urban bakery seemed to many consumers a harbinger of death and disease. These fears ultimately changed the country’s bread. An urgent need to know that one’s bread was pure proved instrumental in convincing Americans to embrace industrially produced loaves. Early twentieth-century bread fears also confused food purity and social purity in a way that placed the blame for unsafe food on some of the food sys- tems’ greatest victims and distracted attention from more systemic pressures, creating danger and vulnerability. As we think about food safety in our own time, the story of America’s bread panic suggests that visions of pure food can motivate desperately needed changes but also backfire in myriad ways. In 1910, the country’s greatest bread bakery opened on the corner of Vanderbilt and Pacific in Brooklyn’s Prospect Heights. Six stories tall with an alabaster white neoclassical facade, it was a shining temple to a new way of thinking about food “untouched by human hands.” Gleaming surfaces, massive machinery, and light-filled halls pro- claimed a new creed: industrial food is pure food, and pure food is the foundation of social progress. During the first decades of the twentieth century, tens of thousands of New Yorkers flocked to the Ward Bakery on school field trips and weekly tours to witness the spectacle. The Ward Bakery in Brooklyn, along with its twin in the Bronx, was the flagship of a revolution in the way the country’s single most important staple was produced and sold. In the early twentieth century, when average Americans got 30 percent of their daily calories from bread, more than any other single food, New Yorkers ate more bread than any other group in the country. New Yorkers also purchased more of their bread than the rest of the country, and they bought a lot of it from the Ward Baking Company. At the company’s height, Ward’s Brooklyn and Bronx factories supplied one in every five bakery loaves eaten in New York City. By the end of the 1920s, the company had extended that power across the entire country, coming astoundingly close to achieving monopoly control over every single sizable bread market in the nation. The Ward family achieved this dominance by pioneering key technological breakthroughs, running roughshod over union labor, laying waste to small competitors, and concocting financial machinations that would have dazzled Gordon Gecko. But the Ward Baking Company owed its uncanny ability to win over skeptical customers to a much larger sense of disquiet hanging over early twentieth-century America. The Ward Bakery went up in Brooklyn at a moment when poor wheat harvests, commodity speculation, and the power of railroad monopolies had stressed bread supplies, causing occasional riots and widespread fear of famine. In the first decades of the twentieth century, “the bread question” was the question for many observers, and it wasn’t just the bread supply that mattered. The country was divided on how bread should be produced in the first place. As one national household advice columnist wrote in 1900, “No subject in the history of foods has been of such vital importance or aroused so much diversion of opinion as bread making.” These specific concerns, in turn, reflected a larger set of perturbations agitating the country. From the 1870s to the 1920s, a singular convergence of forces buffeted the United States, upending all sense of stability and order. Unprecedented influxes of southern and eastern European immigrants, rapid urbanization, explosive technological change, and a series of grave economic downturns strained old institutions built around the dream of an Anglo-Saxon nation of self-sufficient rural communities. Thrust into an emerging system of global grain trading and financial speculation, rural America reeled. Urban infrastructure collapsed under demographic pressures. Corrupt politicians and their private sector cronies stepped in to pro- vide basic services at high cost. Great trusts--vast corporations with monopoly power--came to dominate nearly every important sector of the emerging industrial economy. Work, once carried out on an intimate scale, suddenly felt controlled by distant, impersonal forces. For white, native-born Americans, everything felt undone. Old elites struggled to maintain authority. The poor felt themselves tossed around by the whims of shadowy bosses and threatened by an invasion of foreigners. And elites and the poor alike searched for ways to make sense of a world turned upside down. As many groups faced with great upheavals have done throughout history, late nineteenth-and early twentieth-century white Americans scapegoated--placing the blame for large-scale social change on immigrants and minorities. The period saw some of the ugliest nativism and most violent exclusion of minorities in U.S. history. Racial eugenics and white supremacist theories of human evolution flourished, providing scientific authority for the country’s fear and harsh prescriptions for social improvement.